SOPA/PIPA has been defeated! But we must not rest on our laurels. The greedy, amoral media companies will not stop until the law itself stops them for good. Sadly there is no short supply of corrupt politicians in Congress who put their own selfish interests ahead of the rights of We the People! If SOPA/PIPA has passed it would have meant the end of the open and free Internet a we know it. The media companies and any copyright holder would not have even needed any proof to shut down a site, to have a person charged and facing 5 years in prison. All they would have to do is file a complaint and claim a rights infringement and your website/blog could be shut down. The dirty little secret is that the media companies themselves are behind many file sharing networks. Further these companies like Sony, Viacom, Time-Warner engage in illegal activity. They use malware, aggressive port scanning, denial of service attacks, viruses and packet inspection to gain access to users computers and see what files they have. By treating consumers as hardened criminals these media companies have alienated several generations against them. Not the best business model. The RIAA, MPAA will be stopped, they will finally be forced, by the law and by the market dynamics, that they cannot conduct business like this and will find a profitable and fair business model for digital consumption. 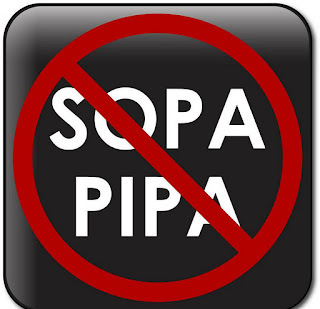 Here's a good article by Dr. Michael Ham on how SOPA/PIPA could have been used to arbitrarily take down websites, stifle business competition and silence scientific debate. Yes I've heard of some "video" companies who would put their awful movie on such sites and then detect who downloaded it. Once they have that information, they sue the downloader for copyright infringement which the current laws entitles the copyright holder $20,000 per infraction. There has been cases where $20,000 is worth more than the movie's production cost and that's how those "video" companies make their money. Yes it's crazy, such unscrupulous companies.